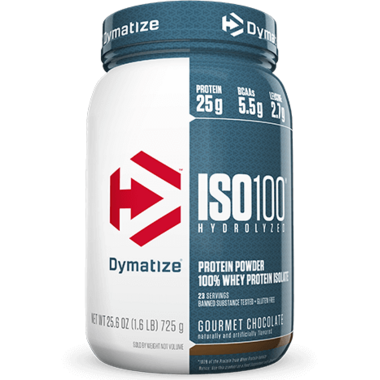 Dymatize Nutrition ISO100 Hydrolyzed Whey Protein Gourmet Chocolate is simply muscle-building fuel. Each serving contains 25 grams of protein and 5.5 g of BCAAs including 2.7 g of L-Leucine. Known worldwide for quality, taste and purity, ISO100 is produced to their highest quality standards. ISO100 is formulated using a cross-flow micro filtration, multi-step purification process that preserves important muscle-building protein fractions while removing excess carbohydrates, fat, lactose and cholesterol. ISO100 is made with pre-hydrolyzed protein sources to ensure fast digestion and absorption. Dymatize knows that maximum protein utilization is essential to aiding muscle recovery and maintaining a positive nitrogen balance, which is critical during periods of intense training. There is no higher standard of protein than ISO100, so feel confident that you will be feeding your muscles to their fullest potential! Great taste, mixability, and nutrient profile. It's pure hydrolyzed whey isolate with added BCAAs, best used post-workout. It's one of the highest qualities of whey out there, with no carbs or lactose! Would highly recommend.